Okay, everybody, I don't mean to alarm you, but I have really fouled things up yet again. 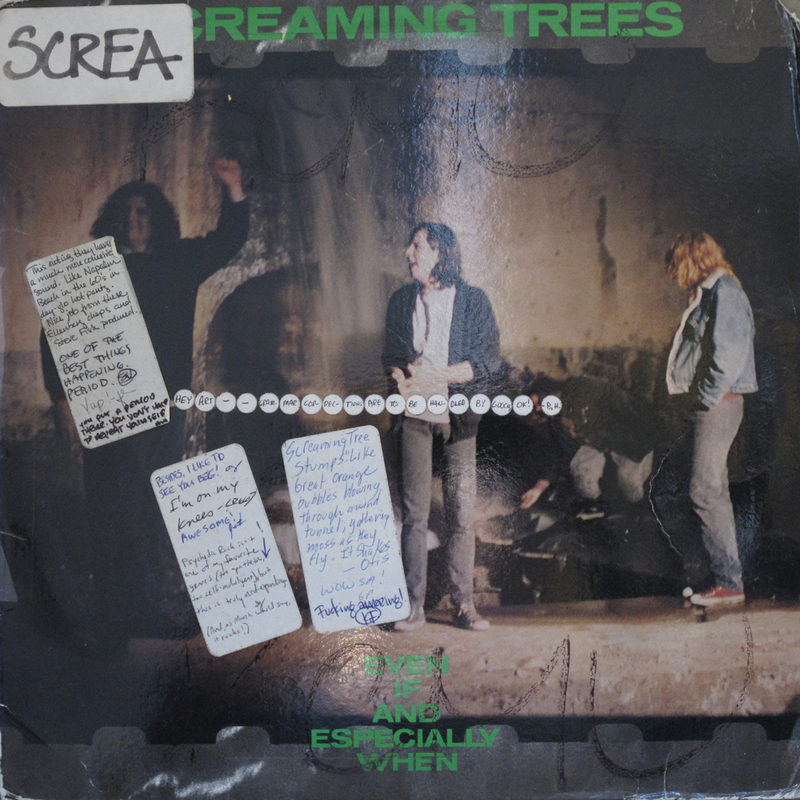 It turns out I've been doing this series for coming up on 12 years, and I have not once featured a Screaming Trees album. How is this even possible? What is wrong with me? We all want answers. But in these trying times, sometimes you just have to acknowledge that you're wrong and move forward. So, in the spirit of healing, I bring you the band's second album, Even If and Especially When. I'm sure I don't need to introduce them to you, and it seems even on their second record, this band from Ellensburg needed no introduction at KCMU, and was received with rapturous adulation (which is always fun to read - along with weird jabs about punctuation and such). Despite my crappy timing in not having covered this essential Northwest band before now, my timing is excellent in one way: Mark Lanegan, the Screaming Tree himself (no, nobody calls him that and please don't tell him I did), has a brand new album coming out in just a couple weeks, and is heading out on tour in May with his band! Go buy a record and go to a show, why don't you? "This outing they have a much more cohesive sound. Like Napalm Beach in the 60's in day-glo hot pants. Nice job from these Ellensburg chaps and Steve Fisk produced." "One of the best things happening. Period." "You put a period there. You don't have to repeat yourself." [this comment spread out over several little white dot stickers, one per syllable] "Hey Art - - Gram mar cor- rec- tions are to be han- dled by gooch, OK! -B.H." "Psychedelic Rock isn't one of my favorite genres (too apathetic, too self-indulgent), but this is truly mind-expanding. (And, as Marsh would say, it rocks!)"